FRS Training, Teagasc and AHI (Animal Health Ireland) have teamed up with four of the leading dairy co-ops around the country, Glanbia, Kerry Agribusiness, Aurivo and Lakeland Dairies, to bring dairy farmers practical demonstrations on how to achieve smarter milking and become more efficient and cost effective. 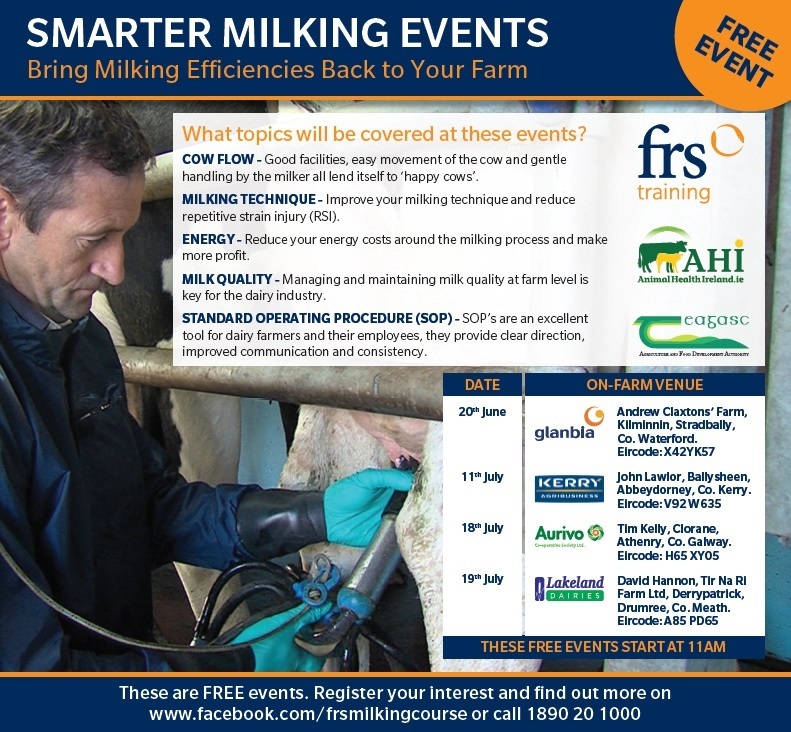 The smarter milking events will run in June and July and cover the areas of better cow flow, best practice milking technique, standard operating procedures, producing high milk quality and how to be more cost effective and are open to all farmers and farm workers alike. Cow flow will cover developing positive experiences for the cow on leadup to and in the parlour to improve milk let down and productivity. Best practice milking techniques includes preparation, milking in batches, cluster management, reducing repetitive strain and teat management. How to write effective standard operating procedures will be covered to provide direction to improve communication and consistency. The important topic of producing the highest milk quality throughout the milking process, including milk recording, will be demonstrated with specific emphasis on reducing Somatic Cell Counts (SSC) and Thermoduric Bacteria Counts (TBC). Tips on how to reduce energy costs will be shared, which aim to save money. The overarching source of information shared through these events comes from the Best Practice in Milking Course which has been available to farmers since 2014 and has trained hundreds of new and experienced milkers through the country. This popular 2 day QQI level 6 course is expertly developed and ran in conjunction with FRS Training, Teagasc and AHI and is part funded by the Department of Agriculture, Food and the Marine. Grainne Dwyer, AHI said; “AHI is pleased to be involved with the Smarter Milking Events. These events are a collaboration between ourselves, Teagasc, FRS and the Dairy Coops and are designed to assist dairy farmers and their staff in the efficient production of high quality milk which will increase output and profitability”. Venue: David Hannon, Tir Na Ri Farm Ltd, Derrypatrick, Drumree, Co. Meath, Eircode A85 PD65. If you are interested in attending the event register now on www.facebook.com/frsmilkingcourse event page.